“Tactical urbanism” was first recognised as a global trend in 2010 and involves the use of less expensive, community based interventions to improve urban spaces. Examples include the creation of pop up markets, upgrades of pedestrian through fares and pavements amongst others. Kleinschmidt explains that “tactical urbanism” is actually a form of civic intervention that allows private citizens and communities to use “low-cost, temporary measures” at neighbourhood level to improve problem areas themselves. This enables them to avoid “the lengthy bureaucratic and resource-intensive processes used by governments and private institutions”. The experimental board game tests how different ideas would work through creating hypothetical scenarios. Characters attempt to upgrade areas using different ideas and a limited palette of materials. When applied to a test site, as shown in his dissertation, the board game allows a player to evaluate the relative success of different design scenarios put forward by different characters with different agendas and resources. Then they can consider the legacy that these temporary installations leave behind. “Exploring the nature of tactical urbanism through these scenarios broaches questions about the role of designers in urban public space and offers an alternative to normative strategic design,” he explains. Kleinschmidt used a selected site – the stretch of Foundry Road running from Salt River Station to the vehicular nexus that is Salt River Circle – to illustrate how the game could be played. Various items ranging from skate parks to a bus shelters were developed to create a more dynamic and enriched set of spaces. These scenarios were then developed into designs, each building upon each other. He notes that his dissertation has raised interesting questions about the nature of design as well as the nature of public participation and how different methods can be employed to enrich the designer’s palette. In summary, he says that his board game shows just how various measures that fall within “tactical urbanism” can address another global trend, namely “spatial inequality”. Spatial inequality is defined as the development of public space that benefits certain, often more affluent, groups to the detriment of others. This determines how space is used and by whom. This is one of South Africa’s greatest challenges. Over time, people become dissatisfied with living in downtrodden areas whilst others are living in upmarket suburbs and it can contribute to social and political conflict and unrest, he warns. “The innovation of Frank Kleinschmidt’s project was to design and play a board game called “Street Tactics” to generate scenarios for the creation of temporary structures that would suit different types of “player,” like the homeless person or the developer for example. Through this process Frank critically explored the intersection between tactical urbanism and spatial inequality to design a new changeable landscape for Salt River, at the front line of gentrification in Cape Town. 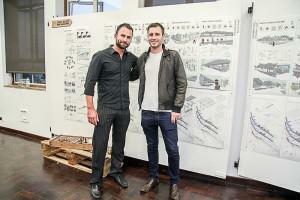 Corobrik’s Manager Western Cape, Christie van Niekerk, said that this dissertation confirmed what Corobrik has known for some time – architecture and landscape architecture are evolving to the point where they are no longer the preserve of a wealthy minority. Instead, they address very real challenges spanning the entire spectrum of urban development. “At Corobrik, we are proud to both acknowledge and help motivate young creatives through the Corobrik Most Innovative Landscape Architecture Award. Now in its fifth year, it paves the way for the creation of sustainable buildings, streets, neighbourhoods, and cities,” he says.